VIDEO: “On Climate Change, Energy and Infrastructure” with Kate Hudson of Waterkeeper. 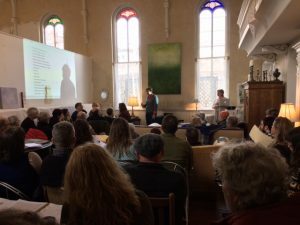 KingstonCitizens.org’s recent community educational forum “PART II: On Climate Change, Energy and Infrastructure” was at capacity. Our special guest Kate Hudson of Waterkeeper helped participants understand better what was a stake today and what citizens can do. VIEW video from the event. Please be sure to visit our upcoming SCHEDULE to learn more about future community educational forums. Special thanks to Kate Hudson for her generosity in sharing her knowledge as our guest panelist; Peter and Julie at Church des Artists for their space, kindness, and for making this video; and, to all of our KingstonCitizens.org volunteers for their assistance. VIDEO: Ulster County Legislature 3/22/17 – Proposed Ban on Memorializing Resolutions. Public Comment and First Reading. On Wednesday night, the Ulster County Legislature held its regular legislative session where the proposed ban on memorializing resolutions had its first reading. 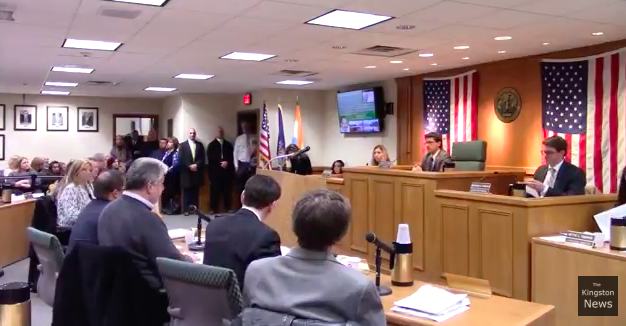 Other important items were debated (and adopted) including a memorializing resolution to request the NYS Legislature expand hate crimes (to include first responders and police officers) and, a resolution to prohibit cyber-bullying. Thanks to all of the citizens who came out to speak that evening on a number of issues. We trust that watching these processes as thoroughly as you are will help to better assist you in speaking to your legislators on these important matters. Speeches that were made by the Chairman, minority and majority leaders are located at the bottom of this post. VIDEO ONE: Public Comment Footage. See names and times below. 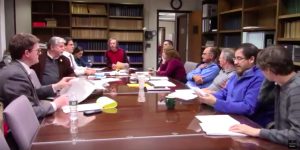 VIDEO: UC Laws and Rules Committee Discuss Prohibiting Memorializing Resolutions. Legislative Session Postponed to Wednesday Due to Snow. Last evening, the Ulster County Legislature Laws and Rules Committee had their monthly meeting with one of the items being to discuss Resolution No. 91 “Amending The Rules Of Order To Prohibit Memorializing Resolutions”. It passed through committee by a 4 / 3 vote. We filmed the meeting thanks to The Kingston News (brought to you by KingstonCitizens.org) so that you can see the debate from last night. We also took the liberty to note the legislator’s districts and localities they represent in the case that one of the members represents you and you wish to contact them directly. Due to today’s snowstorm, the regular legislative session that was to be for this evening was moved to tomorrow night, Wednesday, March 15th at 7:00pm in Legislative Chambers (6th Floor) of the Ulster County Building located at 244 Fair Street in Kingston. Residents can sign-up to speak when they arrive. We ask citizens consider coming to speak tomorrow in opposition of the Ulster County Legislature banning memorializing resolutions. Please keep comments respectful, succinct and no longer than three (3) minutes in length. In the case that the meeting is moved again, we’ll send out an update. PROPOSED BAN ON MEMORIALIZING RESOLUTIONS. Process and Actions in March and April. Only eight months later, District 18 Republican Legislator Richard A. Parete along with Legislators Dean Fabiano (District 3: Town of Saugerties, Town of Ulster) and Kenneth J. Ronk (District 13: Town of Shawangunk) have taken it a step further with a new resolution that would prohibit Memorializing Resolutions altogether. Many citizens were present at the regular legislative meeting in February to speak during public comment and to encourage the legislature to reject a ban on memorializing resolutions. Only upon arrival did we learn that earlier in the day, the Ulster County Legislature’s Laws and Rules committee tabled the resolution instead of passing it through to the floor as anticipated. As reported in the Daily Freeman, Legislator Richard A. Parete stated that “The main reason [I pulled it] is because the full Legislature wasn’t there, and I don’t know if it had the votes to pass.” Parete said he would wait until March when he expects more legislators to be in to introduce the measure.” VIEW The Daily Freeman Article. How does this appear to the public? Not only is a ban on memorializing resolutions undemocratic, but tabling proposed legislation due to not having the votes for it to pass lacks transparency. Thanks for your support and in following this issue through to the end with us. It is not only important for citizens to speak to the issue but to also be a witness. In February of 2017, District 18 (Town of Hurley, Town of Marbletown) Legislator Richard Parate withdrew Resolution No. 32 “Amending the Rules of Order to Prohibit Memorializing Resolutions” for the Ulster County Legislature. 1. LAWS AND RULES. On Monday, March 13th at 6:30 pm it is anticipated that the UC Legislature Laws and Rules Committee (K.L. Binder Library on the 6th Floor of the Ulster County Office Building, 244 Fair Street, Kingston) will discuss whether or not to pass the resolution out to the floor the following evening. VIEW Facebook Event. 1. CONTACT YOUR LEGISLATOR. We encourage citizens to contact their Legislator and request that they reject the ban on memorializing resolutions throughout the months of March and April. VIEW: Ulster County Legislature Website to Find Your Legislator. 2. DEMOCRAT LEGISLATOR JOHN R. PARETE SAYS HE SUPPORTS A BAN. Given this is a Republican supported ban, it is important for citizens to know that District 22 Democratic Legislator John R. Parete has announced that he supports the ban, and could be the swing vote on the matter. 3. SIGN OUR PETITION. Sign our PETITION where your name and any comments that you make go directly to Legislators Richard Parete, Kenneth Ronk, Dean Fabiano and John Parete. 4. PLAN TO ATTEND UPCOMING MEETINGS. Please consider: a) Attend and speak during public comment at the regular Legislative sessions on Tuesday, March 14th (7:05pm) when it is anticipated the legislation will have its first read. No action will be taken and; b) Tuesday, April 18th (7:00pm) when it is anticipated that the Resolution will have its second reading and a vote by the legislature. 5. SHARE WITH FRIENDS! Please share this post with friends to help us to get the word out. Thank you for your support. 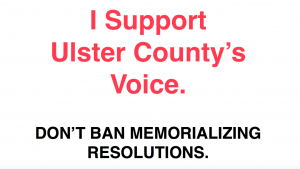 REVIEW: Tell Ulster County Legislature That a Proposed Ban on Memorializing Resolutions is Undemocratic. Click on image to view video. 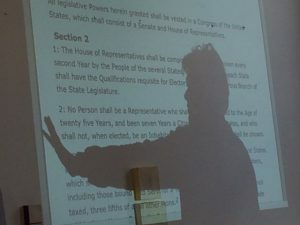 KingstonCitizens.org’s Community Educational Forum: Part I – “On Constitutional Law” with guest Dr. Lynn Eckert. Our first community educational forum “On Constitutional Law” was a huge success. 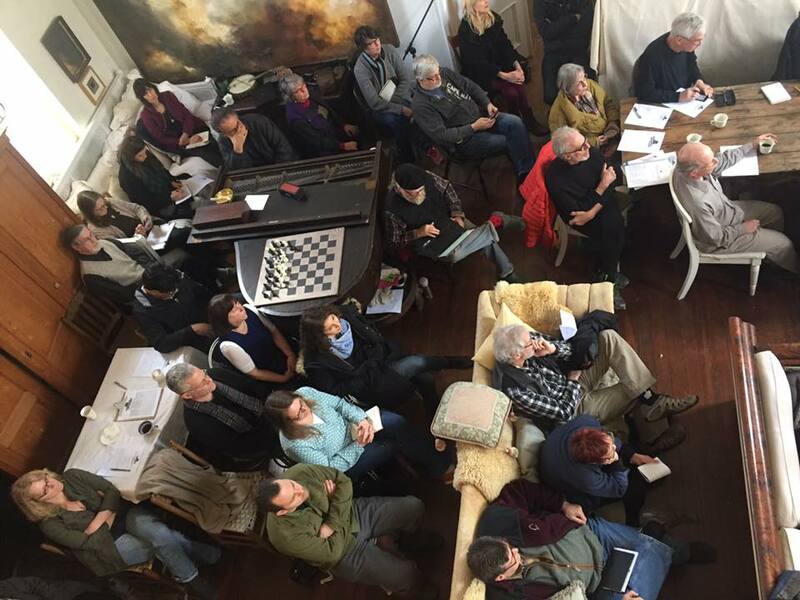 At capacity, citizens took in a three-hour discussion on Constitutional Law as it pertains to the Trump Administration’s initiatives for his (their) first 100 days in office. You can view the video HERE, or by clicking on the image above. We have done general markings to make it easier for the public to follow along (see below). 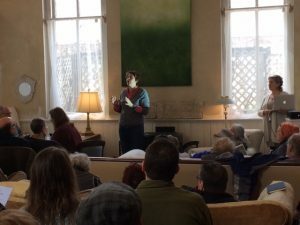 Because of the storm the day before our event, the Rondout in Kingston had lost its power for most of the afternoon making it impossible to stream. We will be streaming however next month, and for all the remaining educational panels throughout the 2017 season. We hope that this series inspires citizens in our region to place more energy in connecting to neighbors and their communities. To become more knowledgeable and less afraid. To emphasize due process and to come to know how to access (and interpret) the laws that are in place to protect us. Special thanks to Dr. Lynn Eckert for her generosity in sharing her knowledge as our guest panelist; Peter and Julie at Church des Artists for their space, kindness, and for making this video; and, to all of our KingstonCitizens.org volunteers for their assistance. Dr. Lynn Eckert: On Constitutional Law: Looking at Articles 1, 2 and 3. Also, 9th, 10th and 14th Amendments. Why Trump is going after the press. How can we bring this all back to us in New York State? KC.org Trump Document – Follow Along! “Do judges need to be lawyers?